1. 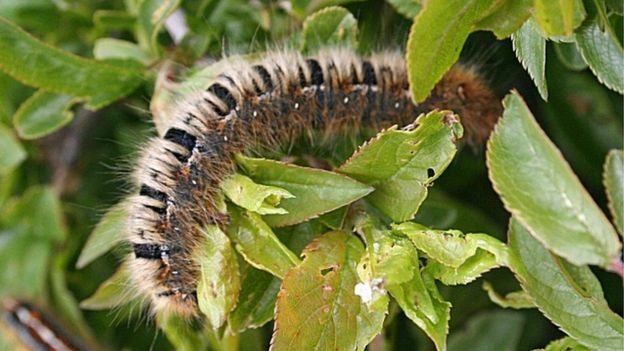 Caterpillars in Lancashire are turning into "exploding zombies". 2. Emailing is still the most common internet activity in Britain. 3. A group of walkers in the Cotswolds claimed they were stalked by a "growling" big cat for more than a mile. 4. About 10 million Britons may have skipped sleep or made themselves tired the next day because they were binge-watching TV. 5. Driverless buses are now on the streets of the Estonian capital Tallinn - there have been "no major incidents" but a number of near misses. 6. Bees understand the concept of zero. 6. An electric pedal bike share scheme has begun in the hilly streets of the Portuguese capital Lisbon. 8. A new water-filled container could reduce the weight of washing machines by a third. 9. The UK's busiest roads could be covered with special "tunnels" to absorb pollution and improve air quality. 10. Food banks are running out of provisions because hungry children don't have access to free school meals during the summer holidays.